Wednesday night (28 October) is the big benefit for the Northside Town Hall capital campaign. 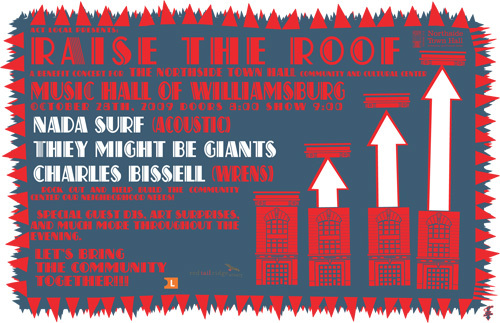 In what the Onion’s AV Club is calling “the Gen X concert of the year”, Charles Bissell of the Wrens, They Might Be Giants and Nada Surf* will be playing a benefit at the Music Hall of Williamsburg. Doors open at 8, and tickets are $25 (for $75 you can get VIP tickets with special seating, free wine and food and the chance to hang out with the likes of, well, me). You can buy tickets at Teddy’s or online at TicketMaster. The benefit supports the capital campaign for the Northside Town Hall Community and Cultural Center, a joint project of two longtime North Brooklyn neighborhood groups, Neighbors Allied for Good Growth (NAG) and The People’s Firehouse, Inc. (PFI). Located in the former Engine Company 212 firehouse in Williamsburg, the Town Hall will serve as a home for these organizations to continue to serve, organize, and advocate for the community. The building will also feature a flexible cultural exhibition and community meeting space on the ground floor. In other words, a great show for a great cause. * The postcard says acoustic – they’ve changed their minds and are now doing a full electric set.